Koobideh kabob are the most juicy and amazingly flavorful minced meat kebabs ever! Using minimal ingredients, these are the epitome of perfection when it comes to grilling ground meat. 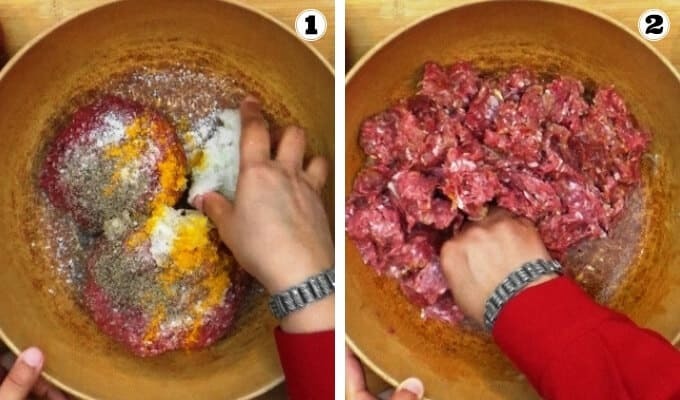 Check out the step by step instructions with photos and detailed tips to help you make your perfect koobideh kebabs. Kabob koobideh is a signature Persian grilled meat dish made with ground lamb/beef or a combination, grated onions and spices. From the streets of Iran to the finest of restaurants, these kebabs are immensely popular. Along with a mound of steamed saffron flavored rice with a cube of butter on top, it makes up for the national dish of Iran, known as chelo kabab. When served with kabab barg (filet mignon kabob) it is known as kabob soltani. With minimal ingredients and an ingenious technique, this classic recipe produces a true masterpiece that has been wowing people for centuries and still continues to dominate Persian menus all around the world. Combine the ingredients and knead it five minutes into a smooth paste. Shape the koobideh on wide skewers. Eight koobideh of about 7 to 8 inches long. Mark indentations on the koobideh with your fingers. And place the skewers on a hot charcoal grill. Grill the koobideh about 4 to 5 minutes on each side. In the picture below, notice the koobideh at different stages of doneness. The first kabob from the bottom, just placed on the grill and when it is ready for the first flip, notice the difference in color on the side that is slightly done and the other side that is still raw and needs to be quickly cooked slightly to make sure that the meat binds to both sides of the skewer. The second kabob from the bottom after the first flip. The top two kabobs that are fully done and ready to be taken off the grill. 80 to 85 percent lean meat is generally used for best results. I prefer 85 percent lean and it works perfectly for me. Some recipes use 70 percent lean meat, but that is too fatty. Fat may make it more sticky and help it bind while shaping the kebabs, but while grilling, the fat starts melting and the meat falls off the skewers more easily. On the other hand, if the mixture is kneaded well into a pasty dough-like consistency, the lean meat portion produces a cohesive mass for making kebabs that hold well while shaping and grilling. 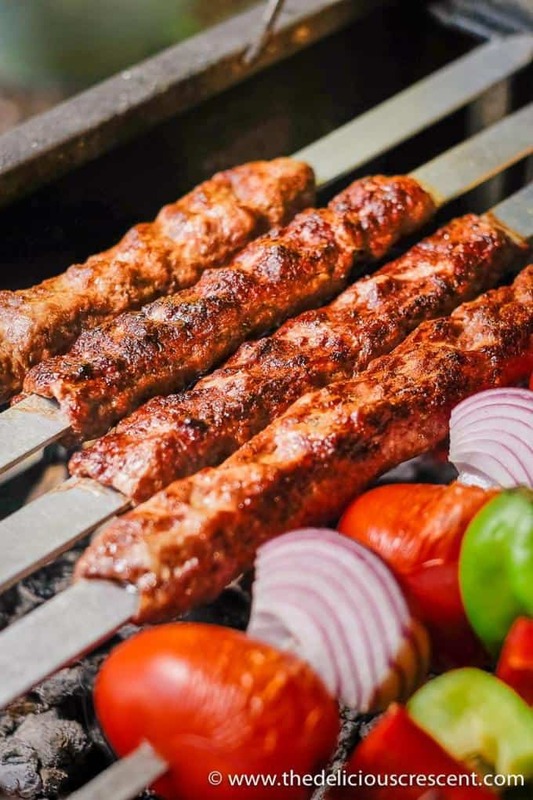 The amazing taste of these kebabs simply relies on good quality ingredients – fresh ground meat with optimal fat content and grated onions; adequate kneading of the meat mixture, a charcoal grill and proper grilling technique. In fact, the trick is more in the technique. The meat cooks from the inside and outside, because the kabobs are wrapped around wide metal skewers which heat up well. And, it is this quick cooking process that gives the requisite juiciness. 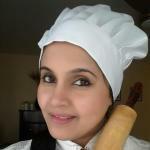 I use onion juice while shaping the kebabs and sprinkle more on them just before grilling, for that robust flavor. Just a solid onion flavor is characteristic for these kabobs. You don’t need too many ingredients, but some recipes additionally use one or more of the following – 2 to 3 cloves of grated garlic, 1 tsp sumac, chopped cilantro, 1 tsp ground coriander etc. If using only beef, then a combination of finely ground chuck and ground sirloin would be good. Sirloin is more lean (90%) and tender, chuck is more fatty (80%) and beefy in flavor. If necessary, you may twice grind it in a meat grinder, not a food processor. Serve the kebabs freshly grilled. If there is a delay in serving, quickly place the kebabs in a layer between two flat breads and in a wide container with a good seal to keep them juicy. They can also be kept warm in the oven until served. 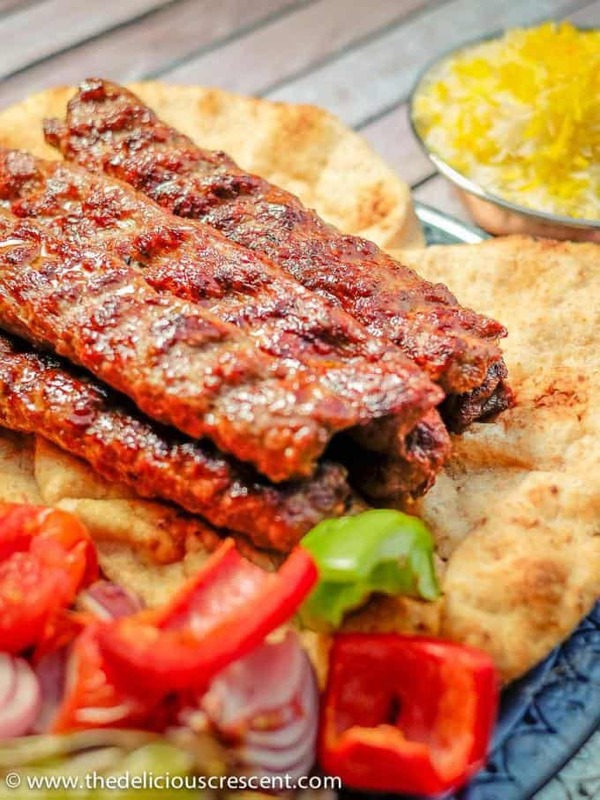 Kabab koobideh recipe in oven: Broil the kabobs on high setting for about 4 to 5 minutes each side. Read the skewer flipping instructions in the recipe. Any juices collected in the broiling pan can be poured over the rice or bread. Reheating leftovers: Sprinkle some water in the bottom of the oven safe dish, cover with good seal and warm it up preferably in an oven. Or place the kebabs over rice and reheat them together. The steam will heat up the kebabs without drying them out. If you have never made koobideh before, don’t worry if it doesn’t work perfectly the very first time. Many people will need to try it a few times for perfect results. Experience teaches how to grasp the finer details. And you will learn with trial and error and become a master! Lamb and beef are a great source of protein with all the essential amino acids. These meats are also a good source of some B vitamins (B12, niacin, B6), selenium, zinc and iron. Grilling ground meat, can result in a significant loss of fat (10 to 33 percent) with the fattier ground meats resulting in a greater loss of fat. For this recipe, I have used 85 percent lean ground meat (15 percent fat). And with an expected fat loss of 25%, the grilled meat will be about 88 percent lean when served. Do choose grass fed meat for its superior taste and nutrition quality with more CLA (conjugated linoleic acid) and omega-3 fats. Grilling meats can result in the formation of HCAs (heterocyclic amines) that may increase the risk of cancers. Make sure to not char the grilled meat too much and scrap off the burnt bits to keep it healthier. And always balance it with plenty of cancer preventive herbs and vegetables as is done traditionally also! Koobideh kabob are the most juicy and amazingly flavorful minced meat kebabs ever! Using minimal ingredients, these are the epitome of perfection when it comes to grilling ground meat. Step by step photos at end of post. Peel the onion and grate it using a box grater and squeeze out the juices. Save the juices for later. Combine the ground meat, grated onion, salt, pepper and turmeric in a mixing bowl. Knead the mixture for about 5 minutes into a cohesive pasty dough-like mass that can be molded and will not drop off easily. The kabob mixture should neither be too wet nor too compact. Make sure that the meat has no extra juices before adding to the mixing bowl. Tip: Freshly ground meat works great. Set the kabob mixture aside. Start the grill about 30 minutes before grilling. We recommend using hardwood charcoal and not briquettes for optimal flavor. The coals are ready when the flame has subsided, are glowing uniformly and covered with some ash. A portable fan or hair dryer can be helpful. 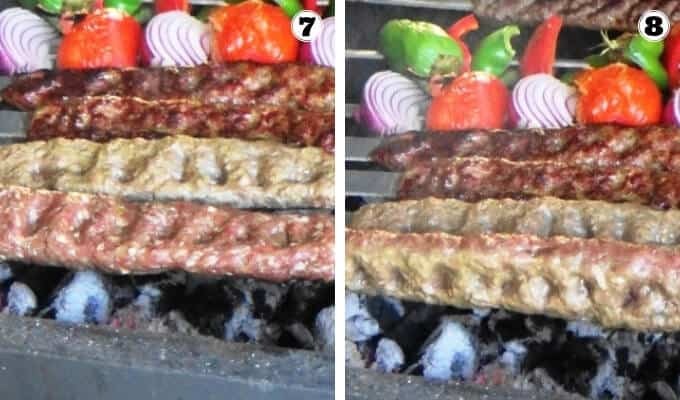 Checkout this tutorial if you are new to charcoal grilling.Tip: Koobideh kabobs can be made on a gas grill but charcoal grill gives you the best results. Divide the kabob mixture into 8 portions. Dampen your hands with the saved onion juice or plain water. Take a portion of the mixture and roll it into an oval sausage shape of 4 to 5 inches. Holding it in one hand, press the thin edge of the sword-like skewer into the lump, simultaneously wrapping the meat around the middle section of the skewer by squeezing it all around. 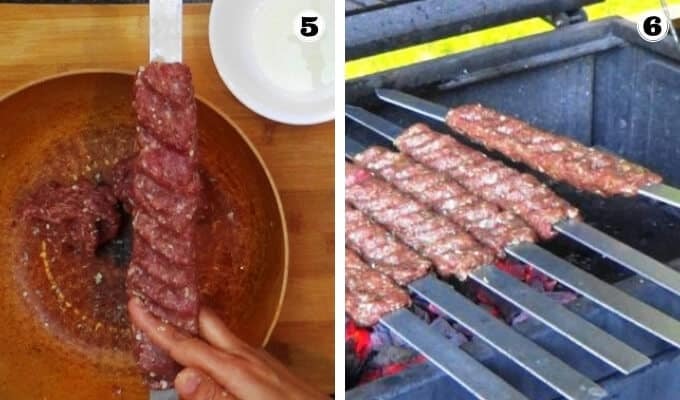 Continue to squeeze the meat gently unto the skewer, gradually spreading and molding it into a 7 to 8 inches long kabob that is snugly and evenly held all around the skewer. The kabob thickness should be about 2/3 inch. Using your thumb and index finger press indentations that are spaced about an inch apart. Alternatively you may use your index and middle fingers and press indentations in a scissor like manner, along the length of the kabob. Place the kabob skewers over a long tray or baking sheet with elevated rims to support the skewers just at the top and bottom. The meat should not touch the base of the pan. It is best to shape these kabobs just before grilling. Sprinkle a few drops of onion juice over the kabobs before placing on the grill. Start grilling the vegetables ahead of the kabobs (or grill them separately). Carefully slide the tomatoes and onions on one skewer. Quarter the bell peppers and slide those or the hatch chilies on other skewer. Brush some olive oil over the veggies. Place the skewers on the grill (check the next section for grilling tips). And when they are about half done, start with grilling the kabobs. Arrange the skewers spacing them apart, directly over the grill without the grate, about 3 to 4 inches above the glowing coals.Tip: Depending on your grill, you may place metal pipes on either side to help support the skewers. Bricks are sometimes lined on either side to create a platform for placing the skewers. 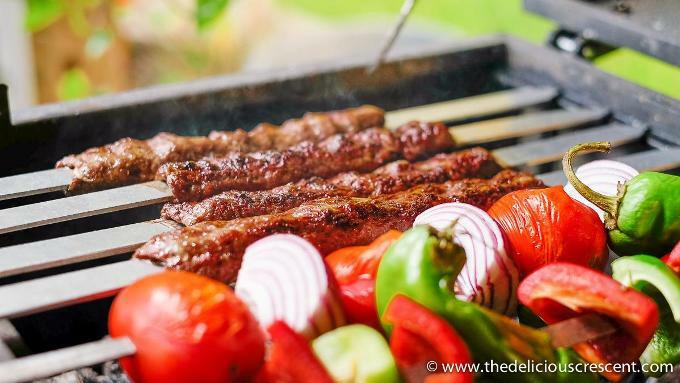 Make sure that the kabobs do not touch the grill and are cooked with direct heat from the coals.Tip: If you are testing koobideh recipe first time and prefer to keep the grate on the grill, make sure the skewers are a bit elevated and the meat does not touch the grate. So while you are learning, even if the meat drops off, you don't lose the kabobs into the coals completely. Within a few seconds, start flipping the skewers over. This helps cook the meat on the outside and attach it to the skewer. It is important to flip them over before they cook too much on one side, or the meat on the other side will fall off. Once the other side is also cooked lightly, turn them over. A good way to do this is, to arrange the eight skewers one by one and then go back to the first skewer and start flipping it in the same order. The kabobs should be grilled for a total time of 4 to 5 minutes on each side. The meat should have a nice brown sear outside and cooked well inside (not pink). Take them off the grill while they are still juicy and tender. Do not overcook the kabobs or they will dry out. Brush the basting mixture just before taking the kabobs off the grill. 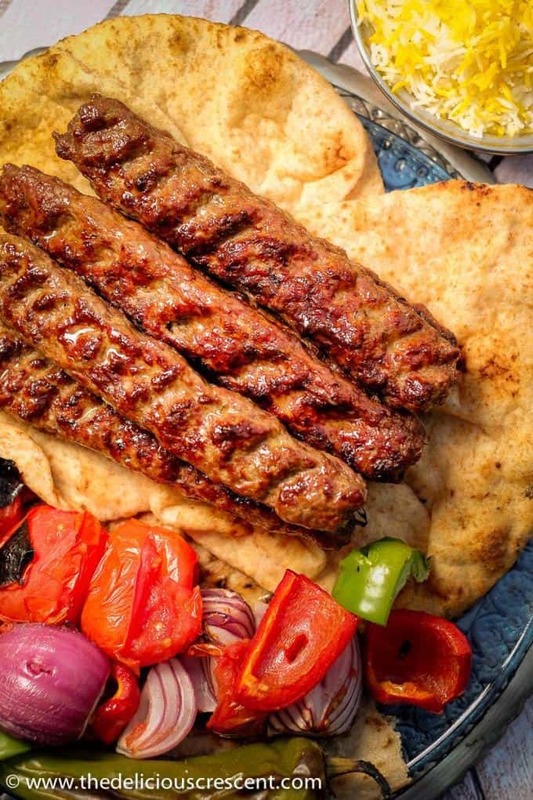 Using a small piece of flat bread gently loosen the kabobs from one end and slide them out to a serving platter that has been lined with flat breads, such as, lavash or sangak. The hot juices from the kabobs soak up the bread. Garnish with a sprinkle of sumac or lemon juice. Keep the kabobs warm by covering with more flat breads. Serve the kabobs fresh off the grill with saffron flavored rice or flat breads, grilled veggies, sumac, fresh herbs and doogh (Persian mint-flavored fizzy yogurt drink). You may also use only lamb or only beef. For beef, a combination of finely ground chuck and ground sirloin would be good. If necessary, you may twice grind beef in a meat grinder, not a food processor. 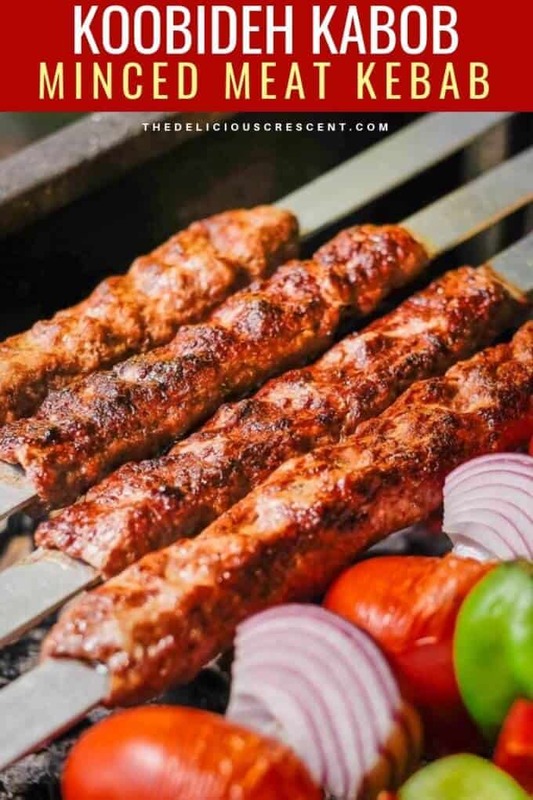 The amazing taste of these kebabs simply relies on good quality ingredients - fresh ground meat with optimal fat content and grated onions; adequate kneading of the meat mixture, a charcoal grill and proper grilling technique. In fact, the trick is more in the technique! The kebabs can also be kept warm in the oven in a container with good seal. Kabab koobideh recipe in oven: Broil the kabobs on high setting for about 4 to 5 minutes each side. Read the skewer flipping instructions in the recipe. Reheating leftovers: Sprinkle some water in the bottom of an oven safe dish with a good seal and warm it up preferably in the oven. Or place the kebabs over rice and reheat them together. The steam will heat up the kebabs without drying them out. The Persian style skewers are available online and at middle eastern stores. Check the full blog post above for more tips. This post was originally published on 17th October 2019 and has been re-published with improvements to the post, tips and formatting. Thanks for tip on using the bricks to get the kabobs above the grill. Also the tip about flipping quickly was also important. I had tried making kabobs with a similar recipe 3 times and could not get the meat to stick. Your tips on how to put the meat on the skewers as well as brick and flipping often I was able to complete successful skewers for the first time! Thanks so much, and they came out delicious. I put sumac in the meat as well in addition to turmeric and salt and pepper.